Anteneh Ayanso is professor of Information Systems, founding director of the Centre for Business Analytics, and chair of the Department of Finance, Operations and Information Systems at the Goodman School of Business, Brock University. He teaches Business Analytics, Database Design and Management, Data Mining Techniques & Applications and Management of IS/IT. 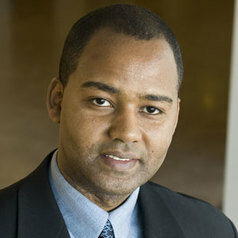 Ayanso received PhD in Information Systems from the University of Connecticut and a MBA from Syracuse University. Ayanso’s research interests focus on data management, business analytics, electronic commerce, and electronic government. He has published many articles in leading journals such as Decision Sciences, Decision Support Systems, European Journal of Operational Research, Journal of Database Management, International Journal of Electronic Commerce, Journal of Computer Information Systems, Information Technology for Development, Government Information Quarterly, among others. His research has been funded by internal and external grants, including a Discovery Research Grant by the Natural Sciences and Engineering Research Council (NSERC) of Canada. He is currently serving as an Associate Editor at Decision Support Systems journal and a review board member at Journal of Database Management, International Journal of Convergence Computing, and International Journal of Electronic Commerce. In 2016, Ayanso was awarded the Faculty Award for Excellence in Teaching and the Graduate Professor of the Year Award. Ayanso was also awarded the Department of Finance, Operations, and Information Systems Researcher of the Year Award in 2014-15. Huizinga, T., Ayanso, A., Smoor, M. and Wronski, T. Exploring Insurance and Natural Disaster Tweets Using Text Analytics, International Journal of Business Analytics. Volume 4, Number 1, 2017. Chen, L., Ayanso, A. and Lertwachara, K. Performance Impacts of Web-Enabled Retail Services: An Empirical Study, Journal of Computer Information Systems. December, 2016. Ayanso, A and Lertwachara, K. An Analytics Approach to Exploring the Link between ICT Development and Affordability, Government Information Quarterly. Volume 32, Number 4, 2015. Ayanso, A. and Karimi, A. The Moderating Effects of Keyword Competition on the Determinants of Ad Position in Sponsored Search Advertising, Decision Support Systems. Volume 70, Number 1, 2015. Ayanso, A., Goes, P.B. and Mehta, K. Range Query Estimation with Data Skewness for Top-k Retrieval, Decision Support Systems. Volume 57, Number 1, 2014. Harnessing the Power of Social Media and Web Analytics: Techniques, Tools, and Applications. Ayanso, A. and Lertwachara, K. (Editors). IGI Global, Hershey, Pennsylvania, 2014. (305 pages). Ayanso, A. and Mokaya, B. Efficiency Evaluation in Search Advertising, Decision Sciences. Volume 44, Number 5, 2013. Ayanso, A., Chatterjee, D. and Cho, D.I. E-Government Readiness Index: A Methodology and Analysis, Government Information Quarterly. Volume 28, Number 4, 2011. Ayanso, A., Goes, P.B. and Mehta, K. A Cost-Based Range Estimation for Mapping Top-k Selection Queries over Relational Databases, Journal of Database Management. Volume 20, Number 4, 2009. Ayanso, A. and Yoogalingam, R. Profiling Retail Web Site Functionalities and Conversion Rates: A Cluster Analysis, International Journal of Electronic Commerce. Volume 14, Number 1, 2009. Ayanso, A., Goes, P. B. and Mehta, K. A Practical Approach for Efficiently Answering Top-k Relational Queries, Decision Support Systems. Volume 44, Number 1, 2007. Ayanso, A., Nair, S. K. and Diaby, M. Inventory Rationing via Drop-Shipping in Internet Retailing: A Sensitivity Analysis, European Journal of Operational Research. Volume 171, Number 1, 2006. Ayanso, A. Big Data: Transcending Disciplines in Higher Education, The evolllution, March, 2017. Ayanso, A. Do You and Your Organization Speak Data?, StrategyDriven, March, 2016. Ayanso, A. The World of Big Data: What it means for HR, HR Strategy and Planning: Excellence Essentials, 2016. Ayanso, A. Is Your Organization Big Data Ready?, Smart Business Network, 2016. Ayanso, A. Big Data Poses Big Questions for Business Schools and Students, Hello Vancity, 2016.